Ask and ye shall receive: Trove is coming to the PlayStation® 4 and Xbox One! Released for PC one year ago, unleashed on Mac OS X in October 2015, we’re thrilled to bring our beautiful, boxy baby to a console near you! With players from more than 100 countries already exploring our vast fantasy environments, now is the time to introduce a whole new audience to the wonders of Trove. Our worlds overflow with thousands of weapons, mounts, costumes, dungeons, and Club Worlds created by Trove’s passionate players. The artistry and imagination shown by our community is second to none and console gamers will soon to get to play in our massive, voxel-y sandbox! Trove is partying like it’s our birthday and the whole world is invited. Let’s take a look back at Trove’s first year! 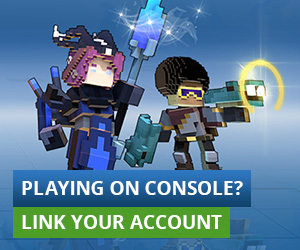 Join the conversation about Trove on consoles here on the forums! Submit your designs on Reddit! ©2018 Trion Worlds, Inc. Trion, Trion Worlds, Trove, Glyph, and their respective logos, are trademarks or registered trademarks of Trion Worlds, Inc. in the U.S. and other countries. The ratings icon is a registered trademark of the Entertainment Software Association. All other trademarks and logos belong to their respective owners. All rights reserved.